I was really excited for this set before they even released half the set. It was around the time they spoiled Sarkhan for Dragons of Tarkhir as well as the Battle for Zendikar and yet, Karn Liberated and Tarmogoyf reprints were all a lot of people talked about around here. See, around this time I was contracted full time and had hardly any time to play standard. With the faster rotations, it felt like a waste of money to spend $300 on a deck that would be obsolete the second or third time I’d have a chance to play. I was a bit worried about having to pay $10 per pack for the draft and assumed a draft would cost me $35 to $40. I was surprised to see how many (if not all) shops were charging at least the equivalent of $45 for one draft set. What stung more was the lackluster prize. Prize structure was 3-2-1 in most shops I asked (prize packs were dragons of tarkir packs) or I could shell out about $55 for prizes to include modern master packs. I think shops were aware how popular the original modern masters were, and realized they could charge any amount they wanted. 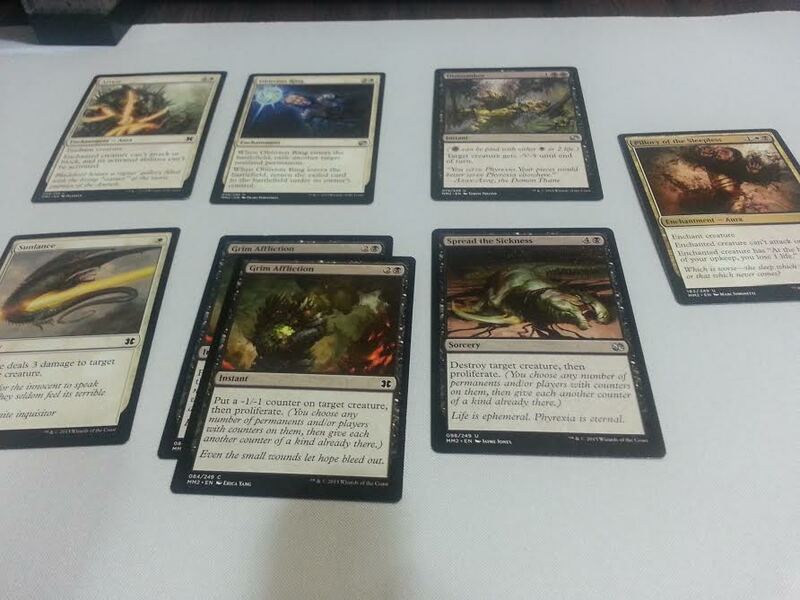 I got my three packs and prayed to get something valuable to lessen the damage the draft did to my wallet. I heard cheers and exclaims of other people’s pulls, including a Tarmogoyf, a Karn, and I think a Foil Cryptic Command. My heart raced as I peered into the last card of my final pack: a Comet Storm. Regardless, the format is fun if you can keep your head in t he game. I didn’t really look into the color combinations and ended up basing my entire draft experience on three powerful cards I got in my first pack: Spectral Procession, Oblivion Ring, and Pillory of the Sleepless. I got a lot of late pick Grim Affliction and assumed black was open. I made a weird halfbreed between black/white spirits and some proliferate deck. My first matchup was close, but I ended up winning by taking flight with my 2/2 bat that kept getting pumped with proliferate. My opponent was confused when I attacked with a random bear, only to be surprised by the Vampire Outcast that followed. amount of fliers I had. My opponent ended up drawing nearly his entire deck, but had no answers to my Spectral Procession equipped with Darksteel Axe. Unfortunately, our match was timed and decided to roll. He won the roll, so I “lost”. I didn’t really care too much after seeing what our prizes were. The last matchup ended quickly because my opponent didn’t want to play his deck. I had the perfect curve game one that the second game ended up with my opponent scooping. I’m glad I got to experience Modern Masters (I missed the first rendition of it), but after hearing stories of people in the stateside with better prizes and cheaper entry, I admit, I was a bit disheartened. 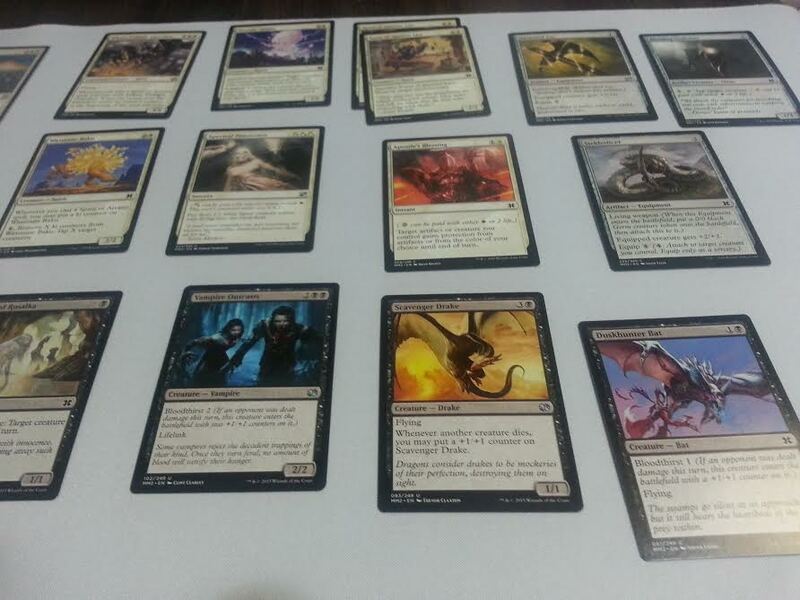 ← Dragons of Tarkir Prerelease: Dromoka!